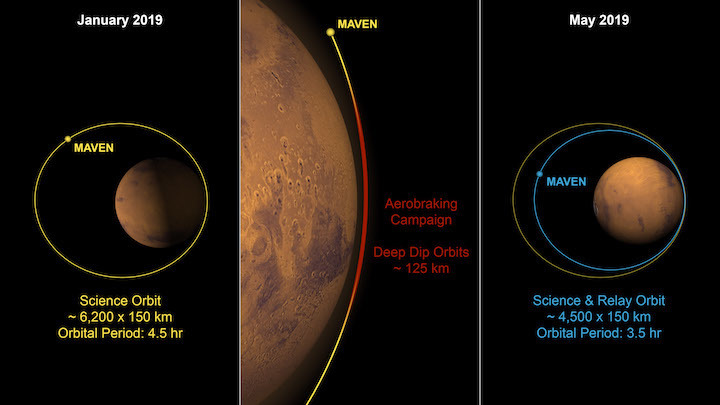 MAVEN has achieved a tighter orbit around Mars to act as a telecommunications relay. The two-month campaign began February 11 and ended April 5. Reducing apoapsis about 1,480 kilometers (1,000 miles) closer to the surface allows the MAVEN orbiter to circle Mars more frequently—6.6 orbits per Earth day versus 5.3 previously—and communicate with the Mars rovers more frequently. MAVEN’s principal investigator is based at the University of Colorado’s Laboratory for Atmospheric and Space Physics, Boulder, which also leads science operations. NASA’s Goddard Space Flight Center in Greenbelt, Maryland, manages the MAVEN project. Lockheed Martin Space built the spacecraft and is responsible for mission operations. NASA’s Jet Propulsion Laboratory in Pasadena, California, provides navigation and Deep Space Network support, as well as the Electra telecommunications relay hardware and operations.